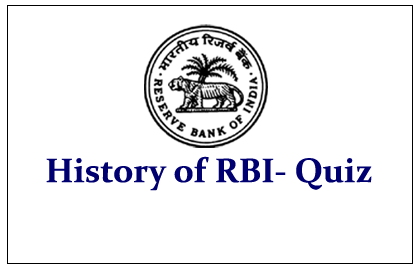 List of Quiz Questions from the History of RBI was given below.Candidates those who are preparing for all competitive and banking exams can use these questions. 1).Reserve Bank of India was formed in______. 2).When was Reserve Bank of India Nationalized______. 3).First Headquarter of RBI was located at________. 4).In which year Reserve Bank of India has moved its Headquarters to Mumbai? 5).Who is the first Governor of Reserve Bank of India? 6).Who is the first Indian Governor General of RBI? 7).Name the commission that recommended the formation of RBI? 8).Which Bank is also called as Central Bank of India? 9).Which Bank is called as Banker’s Bank? 10).Dr. Raghuram Rajan is the ______ Governor of RBI?